A brilliant game - much better than the men! They ran round the pitch like their life depended on it and didn't stand about! An fantastic evening at Wembley in front of 70000 people and they will now play Canada in the quarterfinals on Friday! Grass Snake slithering behind the wall where staff sit regularly throughout the day for their cigarette fix - time to give it up!!! After watching the Olympic Opening Ceremony until 12.45am I just couldn't get up as early as I would have liked. I did make it out of the house by 8.30am to look for grass snakes at work though. I counted at least five different ones including two entwined together. The real poser slithered along a concrete area and alongside a crack in the bottom of the wall (see above). An indian doctor was ringing the hospital to report the snake as it had alarmed him. He said to me that there are thousands in Indian, but he didn't know the UK had any snakes, so I gave him descriptions of the three British snakes that we have here, he seemed very interested. He said it had hissed at him when he got close - well they will if you get too close and move too quickly! I will have to speak to some of the 'officials' at work on Monday as I don't want people getting alarmed. We are privileged to have them here and they are a protected species so there is nothing anyone can do about them. The snake we were watching slithered over the hill and decided to rest in the semi shade. I moved as stealthily as the snake, creeping closer and closer. My initial shots were with the 300 f4 lens but I went back to the car and changed to the Macro lens. Eventually I laid down so I could take eye level shots – I was less than a foot away!!! It was magical being so close to this beautiful creature. The girls at work would have been horrified if they had seen me doing this and even more horrified when I stood up later to stroke its tail as it slithered down the hill, to coil around the bottom of the oak tree. It then coiled back on itself in a striking pose as if to say 'you have pushed things too far now'. I retreated back at this point to save it hissing at me and went back to the car. I picked both my sisters and we visited my parents for a while and then went to Holme Reserves. Along the Firs Road, the standing caravan has now been replaced with a huge wooden chalet type building, more trees cut down and looking much too formal for my liking. Sad when things have to change, so many wonderful memories of pockets of land and fields that were good migrants spots, now replaced by houses. The thing I miss most of all is the telegraph wires that ran over the marsh down to the Firs House – these wires were awesome for birds to perch on, swallows and martins would congregate on the wires, kestrels, starlings etc etc - a bee eater probably being the most exciting highlight to have rested on these wires. My sisters and I were reminiscing about our childhood days, as we sat on the seats at Holme Bird Observatory. There were sandwasps burrowing in the bank and a large white butterfly was seen, but no other butterflies at all. We walked over on to the beach and along to the path that crosses over to the NWT Firs House. There were 5 ringed plovers and several dunlin feeding along the shore and sandwich terns were flying past, but little else apart from holiday makers, dogs and mini barbeques, which are banned by the way - that's the barbeques not the dogs, but pity its not both! Had a quick look in the hide at Redwell Marsh and for the first time saw absolutely nothing! Took my sisters home and spent the rest of the evening, sorting through pictures. The poster below has been taken from the Reptiles and Amphibian Conservation site. Wild Boar Skull from the Ice Age found at Holme!!!! West Norfolk youngster Nathan Welham finds 'treasure' on beach when he uncovers a wild boar skull which dates back to the Ice Age!!! Wow what an incredible find!!!!! Grass Snakes basking in the sunshine at work! Rich Wildlife on my doorstep! Several spectacular views of grass snakes at work today. I went back this evening with my camera and of course none were on show to photograph! Although I did see a very large grass snake slithering amongst a huge pile of concrete – I know it was big, because it took a good few seconds before I saw the tail! I will try again over the weekend for photos. Sandwasps were burying in a sandy bank and Digger Wasps were busy excavating tunnels in the same place. Cinnabar caterpillars adorned the ragwort and hoverflies and honey bees were buzzing around. London Olympic Games Opening Celebrations!!! The best show I have ever seen!!! What an absolutely incredible night. The film at the beginning, as though you were a bird racing over rivers, through London etc portraying a snapshot of Britain was jaw dropping. I loved the James Bond and the Queen arriving by helicopter scene - I really did believe for a moment that Her Majesty was going to arrive by parachute! Mr Bean was hilarious. Dizzie Rascal with 'Bonkers' was brilliant. The dancers spanning music over time were phenomenal. 15,000 volunteers took part - amazing stuff. Muhammad Ali, a 1960 Olympic gold medalist was there - awesome! Hundreds of nurses and patients represented the NHS performed, Pearly Kings and Queens, lots of Mary Poppins's floating down with their brollys, the list goes on. Athletes from all countries taking part paraded around the stadium in their national dress and carrying their flag. Sir Chris Hoy carried the flag for Great Britain. David Beckham brought the torch by boat to handover to Sir Steve Redgrave who then carried it into the stadium to hand it over to young atheletes who lit the beginning of the lighting of the cauldron, which was a show in itself! Sir Paul McCartney ended the show with 'Hey Jude' and firework finale. Thursday 26th July – afternoon. After I left 'The Three Swallows' Pub in Cley, I got changed into 'birding' clothes and went to see three Silver-washed Fritillaries, White Admirals and White-letter Hairstreaks in the late afternoon sun and got some decent pictures aswell! Sat in the car and had a sandwich and a cup of tea. 4 Spoonbills flew across me west towards Blakeney. I felt exhausted now and needed a nap. I had a luxurious snooze for about an hour! Walked across the shingle to wake myself up and watched the sea for a while – no birds of note, but just beautiful being here, watching the waves crash onto the shingle. It felt cooler now, so swopped sandals for trainers and went to the hides. Joined Eddie and Andy J who were both at the funeral this morning too. Eddie had counted 317 Dunlin just before I walked into the hide!!! There was a good selection of birds including the usual avocets, lapwings, redshanks, 1 juv. greenshank (seen before I walked in the hide), black-tailed godwits, ruff, ringed and little ringed plovers, shelduck, 2 curlew sandpipers, loads of gulls, little egrets flying around, marsh harriers, pied wagtails, goldfinches, reed warblers etc. Also hundreds of starlings flocking. Eddie and Andy left and I stayed alone until the sun set. I booked today off work so that I could go to Robin Abel's funeral. As I type these words I still find it hard to accept that he is no more. It's always such a shock when someone dies so suddenly and unexpectedly. I arrived at St Faith's Crematorium, just north of Norwich for the 11.45am service. There was a good turnout from the birding community to pay their last respects. Robin was very much liked by all who knew him and his death has saddened so many people. The chapel was not only full, but people were standing. The minister conducted a lovely service and the hymns were beautiful. I joined other birders and family afterwards at the 'Three Swallows' in Cley where Robin's nephew thanked us all for coming. Robin had twin brothers, which I don't think many people knew he had - I spoke briefly to one of them as I left, both brothers seemed lovely people. A beautiful service for a beautiful soul. KILLER WHALES seen in Norfolk!!!!! RBA: 2 Killer Whales on Thursday off Bacton Beach at c7pm. What a fantastic sighting! Pity this news is almost a week ago though! Adders and Grass Snakes take over at work!!!! Slight exaggeration!!!! But several Adders and Grass Snakes have been seen over the last few weeks with more than several seen this weekend, basking in the sunshine in the staff carpark!!! One nursing auxiliary took a picture of a large female Adder on her phone this weekend and was horrified when I told her what it was and that it was poisionous. Another member of staff said "they will have to do something about that"!!!! In reply I explained that there is nothing anybody can do about Adders as they are a protected species and are not harmful unless provoked. I myself had a brief view of a very large grass snake slithering away into the bracken only a couple of weeks ago. One adder had been run over by an ambulance this weekend I was told. I spent a while looking for them lunchtime, but not an ideal time to find adders in the hottest part of the day, so I gave up and sat under the shade of a large oak tree for my lunch – I made sure I had a good look before I sat down! The land adjacent to the hospital is part of the NWT Roydon Common which is a stronghold for Adders in Norfolk. 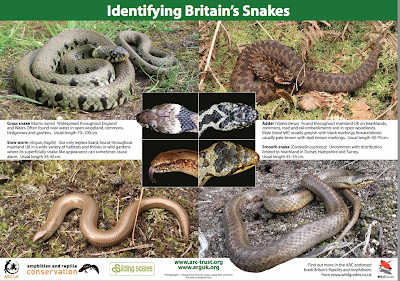 Some information on Adders is here. A Roseate Tern was at Titchwell RSPB today - see pictures here. A White-rumped Sandpiper at Snettisham RSPB. I feel shattered most of the time at the moment, must be my age! We have been short staffed at work for a while now, which makes everyone in the team exhausted at the end of the day. I have had an ear infection for approximately 10 weeks and no anti-biotics have cured it, so my GP referred me to an 'ear, nose and throat consultant in early August - hope its gets sorted soon, its beyond boring now. Couldn't get up early today, too tired. A brilliant sunny day with no rain - makes a change! I arrived at Cley and had lunch in the NWT Visitor Centre. Went for a quick look at 'Cley Fair' by the church which was from 2pm-5pm - several stalls including craft, tombola, cake stall (I resisted), plant sale, bric-a-brac etc and books for sale in the church along with cream teas! Got a text from a friend via someone else to say there were a couple of Silver-washed Fritillaries at Holt Country Park, so off I went. The carpark prices have gone up from £1.00 to £1.50 - don't even think of not paying as John F. told me that a white van comes round the carpark randomly and slaps a £30 parking ticket on the cars that haven't paid! Found Mr Furse who joined me to search for the Fritillaries, which of course were now not showing when I arrived! Eddie joined us a bit later too. Birds seen here: Treecreeper, both male and female blackcap, stock dove calling and a song thrush with a beak full of food. Butterflies seen: a single Red Admiral, several White Admirals, a Comma, Ringlet, Meadow Brown. At Holt Lowes I saw and photographed a female Keeled Skimmer. Several bees were seen including the new Tree Bee (Bombus hypnorum) see useful site here and several hoverflies - see interesting site here. Some Birds' Nest Orchids were also seen which Eddie found. I gave up searching for Silver-washed Fritillaries! Still like a jungle and extremely overgrown now, the bottom path is almost non-existent. Swallows flying around the carpark and sandwich terns flying west. 2 Med Gulls, 3 Yellow-leg Gulls, 6 Spoonbills flying east, several Little Egrets flying around, a single Greenshank, several Redshanks, 2 Spotted Redshanks, several Egyptian Geese, Little ringed Plover chicks, Marsh Harriers, Avocets with young, Black-tailed Godwits and two hares lolloping around. A few cormorants flew over the hide to roost. Holme Bird Observatory Moth Day! A ringed CASPIAN TERN has been delighting birders this week since Tuesday. The bird has been very mobile between Strumpshaw Fen, Rockland Broad and Buckingham Marshes, several pictures on RBA, BF, Surfbirds and Birdguides. See fabulous picture taken by Rob Wilson here. Sadly no sign of it today though! My Caspian Tern photographs from last year at here and here. "Butterfly Conservation President Sir David Attenborough has warned that butterflies could suffer serious population crashes this year following record-breaking wet weather." Got up late, visited my parents and delivered a huge coffee cake to father which I bought from the Knightshill Farm Shop at King's Lynn. Father loves coffee cake and so do I - but I didn't have any at all as I am dieting again (seriously this time, no really!). Complete waste of time as all you could see out of the flaps of Hide 1 and 2 were reeds. The skies were gloomy and grey and not a single butterfly was seen either. Bumped into John F. and Pete S. and together we walked to North Hide in hope of the Pectoral Sandpiper that was seen yesterday. The sun had finally decided to break through the grey clouds and it turned out to be a beautiful evening. Nice selection of birds including marsh harrier, several ruff, avocets, dunlins, redshanks, spotted redshanks, black-tailed godwits, 7 Spoonbills, lapwings, cormorants, shelducks etc and LGRE! No Pectoral Sandpiper in view though! The Short-toed Lark at BP had only been seen first thing this morning. I suddenly remembered about the recent Red-veined darter Dragonflies that have been seen at Kelling, so off I went with John F. Paul W. and others to find them in the now glorious sunshine. Black-tailed Skimmers, meadow browns and bees were seen. 2 Egyptian Geese on the edge of the pool and that was it. But I did have awesome views of a barn owl hunting and actually got some half decent shots on the camera, which cheered the day up. Went to Walsey Hills to inspect the bottom public footpath - what bottom path? Its as though there never was a path its so overgrown - never seen it this bad. Lets hope the local council cut this back soon - its going to be seriously hard work to cut back, now its in this state! It was now 7.45pm and a bit too late to bother going to the NWT hides so went to Cley Coastguards again - sat here eating the rest of my lunch/tea. Norfolk Exhibition Project Committee has some arty farty pieces located on the shingle bank at Coastguards including a giant Teepee constructed from reeds, a giant metal toaster and two other pieces. Saw a barn owl here and watched the swallows flying back and forth to their nest. Sandwich, Common and Little Terns all going west along the beach. 2 spoonbills flew east across Beach Road as I left. A beautiful sunset this evening with shards of light radiating down to the horizon over the sea. The finale of Festival Too was this evening with headline acts being Marcus Collins and Lemar, but I couldn't be bothered to go. Late Bird News and a Short-toed Lark at BP! Worked a psychopathic shift this morning – can't say any more than that! Let's just say I was glad to finish the shift! Caspian Tern (yesterday) at Wissington Beet Factory. Caspian Tern (again yesterday) reported 'past Cley'. Andy Murray's tears after losing Wimbledon Final to Roger Federer! Congratulations to Roger Federer for his 7th Wimbledon title and to Andy Murray who most definately ruffled Roger's feathers in the first set – they both fought for their lives! Heart breaking for Andy at the finish. Wind Farms get go ahead as long as 'no more than 94 birds' killed per annum!!! After the shocking news of Robin Abel's sudden death I felt rock bottom today – goodness knows how his closest and dearest friends are feeling, never mind his family - my heart goes out to you all. My original plans were to go to RSPB Frampton today as I have not been there for a very long time and wanted to see how this reserve had developed since my last visit. I see on RBA a White-rumped Sandpiper turned up there today! Its been torrential rain most of the day with a few sunny intervals. Currently pouring with rain as I write at 8.30pm. I was going to Festival Too this evening to watch the Brand New Heavies, but most definately not in the mood for it now. Congratulations to Serena Williams who beat Agnieszka Radwanska in the Wimbledon Final - see here – I wanted Agnieszka to win though – she worked so hard when she was obviously so ill. Very, very sad indeed, heard this shocking news late last night and although I only knew Robin for a short time compared to others, it's really rocked me - couldn't leave the house today. Robin lived in Norwich and lived for his birds and year listing. Such a lovely man, and although he came across as a quiet person, he had a wicked sense of humour. Robin was only 59 years old, he certainly looked younger. His last picture posted of the Squacco Heron at Welney last week on Birding World website here, so so sad. Every good bird that turned up in Norfolk and Robin was there for his year list – our paths crossed many times when I did my only year list in 2009. His sudden departure from our lives will affect many – my sincerest condolences to his family and friends. Torrential Rain and some very sad news indeed! Finale of Festival Too is next Friday 13th and Saturday 14th. Had to whizz over to my parents after Andy' Murrays Semi-final victory to sort their television out as quote from mother 'father had done something to the telly' – mother couldn't watch the tennis! I sorted it out for them and I watched the highlights of the match again with them before going home. Also father wasn't very well again today - so worried about him. My mother had to 'deal' with a horrible bully of a man this week who lives in the village – a very selfish, nasty person, who if I had been a 'son' I would have gone round to his house and decked him, if only I had a big brother! Mind you, it riled me so much, that someone has upset my mother, I feel like going round myself anyway!!! Its been like that at work this week as well – had to fight back the tears this morning in 'handover'. I am in the wrong job really, I get too emotionally attached to my patients. Andy Murray beats Jo-Wilfried Tsonga!!!!! Andy Murray has become the first British man to reach the Wimbledon men’s final for 74 years in a thrilling semi-final against Tsonga, beating him 4 sets to 1!!!! Andy Murray – Wimbledon Final – Sunday, against Roger Federer!!!! What a match that's going to be! Land's End to John O'Groats for Charity!!! My work colleague Lydia Payne is cycling 1000 miles from Land's End to John O'Groats for the Alzheimer's Society. If anyone would like to sponser her, here is the link. Thank you. Andy Murray beats David Ferrer! It was such an incredibly exciting match. Andy now goes on to play his fourth successive semi-final against Jo-Wilfried Tsonga on Friday. I don't know what time the semi-final starts on Friday, but I bet its while I'm working. Once I have finished choosing, editing and adding ALL pictures to my blog, I vow NEVER to get behind again! This is a MAMMOTH task. They are being added slowly on a daily basis. Currently working on July 2011!!!!! "Extraordinary footage from an ultra-high speed camera captures and illuminates shark behaviour in a wholly new way..........."
I hoped that the Squacco Heron would stay another day, but when I looked at RBA at lunchtime there was 'no news' – typical! I had gone to great lengths yesterday to swap my working day with my colleague Sarah, so that I could do her early shift, to enable me to finish at 3.15pm. I know there was 'no news' but I decided to go anyway. I was on the road by 3.30pm and arrived at Welney at 4pm. I was told on arrival that there had been several people looking for the bird this morning. When I walked into the Reedbed Hide there was no one else here – I searched in vain. It was spitting with rain the whole time I was there. Walked out of the hide and walked further along the track to the furthest point and then back again to the centre. Oh well, you win some, you lose some! Sat in the car and had my tea – sandwiches which I had made last night. I was so tired at this point I started to fall asleep. Along Ten Mile Bank Road I saw three Grey Wagtails flit away by the roadside. I was so close to Ely where my little sister Vivien lives, it was very tempting to surprise her, but I felt exhausted, so sensibly drove back home. Working 6 days a week is getting tougher and tougher now I am getting older – poor 'ol gal'!!! MEGA – Western Black-eared Wheatear!!! Late news as only now identified by photograph. At RSPB Frampton on 12th June – a first summer female. Pity this bird's not still around!!! SQUACCO HERON still at Welney WWT today!!! I am REALLY hoping to see this bird before it disappears – will keep my fingers crossed that it stays – PLEASE!!! Three Red-veined Darter Dragonflies still at Kelling Water Meadows today. Watched most of the Final of Euro 2012 after I finished working all day. Spain just wiped Italy out! I wanted Italy to win, I really felt for them at the finish – someone has to lose I suppose! Saw MG's name come up in the credits at the end of the programme.